I found this little gif interesting. Is this humane slaughter? It’s certainly extremely efficient. Research to find the cartoon’s title tells me that this animation comes from an episode called “I Eats My Spinach”, which involves Popeye briefly engaging in a bullfight, with the ending pictured above. However, the same research also leads to a synopsis of an episode called “Bulldozing the Bull” where Popeye refuses to attend a bullfight on ethical grounds — “It’s cruelty to aminals” — and later befriends the bull. Nothing profound here, just a little glimpse of something. Also, the one cut of kosher meat intrigues me. “Grumpy Cat” — whose actual name is “Tard“, theoretically short for “Tartar Sauce” — is just one of many “oh look at the cute animal” memes that have gone past my radar over the past few years. I’ve seen Sam, once voted the World’s Ugliest Dog; Thumbelina, billed as the world’s smallest horse; and an infinite number of critters on sites like Cute Overload. These are not happy animals. I cannot laugh at them, not even if they are humorously posed and captioned. They look the way they do because some humans got together and thought, Wouldn’t it be great if dogs/cats looked more like human babies? and bred siblings to each other until the offspring looked sufficiently funny. The fact that the animal can’t breathe, can’t see, and can’t eat is meaningless — look how cute it is! It almost looks human! I am not arguing that we should not breed, for example, Persian cats, because breed-standard Persian cats do not necessarily look like “Tard”. (It should be noted, however, that there are good arguments against extreme type-breeding in purebred animals.) I am arguing that, when man’s interference with nature produces its inevitable sports, we not give the poor things contracts to do television commercials and buy T-shirts celebrating them (and, indirectly, the process which produced them). I don’t support irresponsible animal breeding — why should I support its byproducts? This is almost certainly not real — in the sense that it is likely not written by a quitting animal control officer in Comox Valley, British Columbia, as an official grumbling rant, at least. In fact, here it is in a prior (and not necessarily its original) form, as a “best of” Craigslist post from 2006. Its sentiments certainly ring true, however, despite the dubious veracity of its origin, which is likely why it’s being passed on. I’ve certainly had similar sentiments occasionally. It is interesting that these sentiments most often crop up anonymously. We forward this and repost it, agreeing with it implicitly — why are we not saying it ourselves? The other day I was on Netflix, eagerly absorbing episodes of a show called How It’s Made, which is like little pieces of mind-candy — bite-sized nuggets of How They Make cast iron cookware, ketchup, swiss army knives, contact lenses…fascinating stuff. In amongst these mostly neutral items are individual episodes which mention how they make things like pet food, hot dogs, deli sausage, fur coats, smoked ham, black pudding, and bacon. To watch this show, none of these things seem to involve living animals in production — fur coats, for example, begin with a stack of tanned beaver pelts which apparently grow on trees or simply appear out of some other dimension. Hot dogs begin with “trimmings”, the origin of which is not discussed in detail. Hams “come from the hind leg of a pig”, but how they get them off the pig is not mentioned. In the “pet food” episode, no meat is mentioned, until the very end where they mention that “animal fat” is sprayed on the (up til then) apparently completely vegetarian, wheat- and corn-based food “to make it palatable”. I know the show isn’t about animal rights or animal welfare, and adding the bit about how they kill the pig/beaver/etc is extraneous to their message. I just find it interesting (not bad, just interesting) how they gloss over the, er, “sticky” bits of information in their pursuit of a neutral-as-possible sound bite. Today I was using Microsoft Publisher 2010, part of the Office software suite, to make a flyer for my place of work. I was looking through the standard, included templates, trying to find a template with tear-off strips for phone numbers at the bottom. Among the three or four templates with that design I noticed one with a little dog icon and a suggested sample caption of “FREE Puppies or Kittens”. The template can be found under “templates/flyers/all marketing” if you’re interested in seeing it yourself. I can’t find a link to it on Microsoft’s site, but here’s an excerpt from a Publisher “how to” book, telling you how to use an extremely similar template (“Free Kittens!”) in Publisher 2007. The dangers of “Free to Good Home” ads aside…this is just a scary little picture of how pervasive the idea of “animal as object” is in our society. 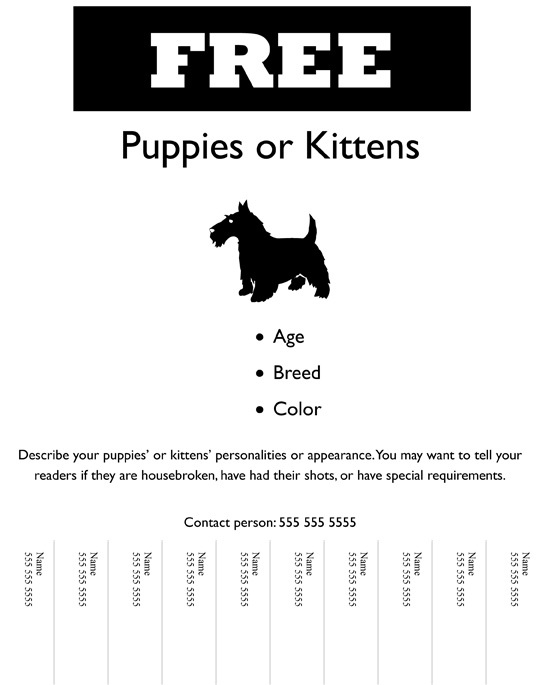 It’s so thoroughly ingrained that someone thinking I need to make a sample flyer with tear-off strips immediately came up with “giving away unwanted animals” as a subject for their sample flyer.